Written by Lawrence D. Cohen. Adapted from the 1974 novel Carrie, written by Stephen King. Starring Sissy Spacek, Piper Laurie and Amy Irving. King has a special talent of probing into the archetypal forms of horror that have roots in our culture and putting that menace into mundane settings – not in castles or caves but in high schools, hotels and suburbs. We recognize, identify or sympathize with the characters we find in King’s world because the tropes are often familiar to us. Nowhere is this more apparent than in Carrie, his breakthrough novel of 1974 and cinematically, the 1976 movie remains one of the best adaptations of a King story ever created. Carrie White is the ugly-duckling – trapped in a home with no comfort or protection, but even moreso, King’s novel Carrie appears as a warped Cinderella story. Her religiously fanatical and sexually repressed mother more than substitutes for a cruel and vindictive step-mother and her high-school peers torment her as much as any ‘ugly-step-sisters’ could. No fairy-godmother comes to her aid, but a guilt-ridden classmate who lends her a ‘Prince Charming’ so that she can go to the ball. But this gift has consequences – the ‘Prince’ does not really belong to her and the ball turns out to be her downfall, not her salvation. The original mythic version of the Cinderella story, before it was softened over the centuries, was a more grim and gruesome tale – Cinderella was given the chance of revenge upon her family and she subsequently ordered that their noses and hands be cut off. This is not the Cinderella of later days when virtue and kindness were supposed to be their own reward, but an earlier version of that character, who believed in exacting a revenge for her mistreatment. Carrie White (as played by Sissy Spacek in the movie) takes her vengeance even further as she wreaks havoc on the whole town in a display of psychokinetic rage. This is not to say that King necessarily set out to write a modern day Cinderella story with a nasty ending, but he experiences the same cultural resonances as the rest of us, and it would not be unusual for him to use this familiar archetypal conflict to illustrate his tragic morality play. The film begins in the all-female world of the girls’ locker room and the camera glides in sensual slow-motion past nubile teenage girls, frolicking in various stages of undress. The camera then finally settles on Carrie White, alone and naked in the shower, enjoying a moment of solitary pleasure in steamy privacy when amid the stream of suds and water down her inner thigh there is a sudden and unexpected gush of blood – her first menstrual period. Not knowing what it is, she is panic stricken. Her screams only bring the other girls to the scene and, gleeful at her terror, they pelt her with tampons and towels, shrieking ‘plug it up’! No longer nymphs, they appear rather as tormenting demons. It is a traumatic transition from innocence into mature female sexuality. Carrie’s opening scene also indicates the pitfalls of voyeurism – what the viewer might initially have thought to seem pleasurable in form, in reality turns out to be sinister in content. The shower-scene hints at some possibly threatening aspects of female sexuality become more explicit when, as a by-product of her period, Carrie White also develops telekinetic powers (the connection between the power of the female menstrual cycle and the cycles of the moon were explored as a different kind of ‘curse’ in the film Ginger Snaps). 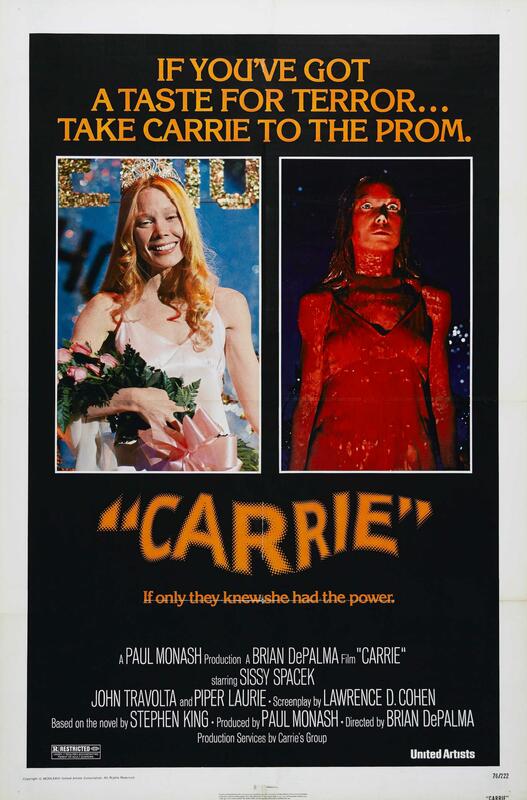 Carrie is not liked at high school – she is odd, she has a fearsome, fanatical mother, she isn’t particularly clever and she doesn’t subscribe to conventional forms of ‘prettiness’. She is the ‘outcast’. But the shrinking violet, the mousey pariah, has her moment of triumph at the Prom, when she is crowned queen along with her ‘Prince Charming’ (Tommy Ross) over the more popular, prettier and accepted girls who had been her tormentors. But her moment of happiness is short-lived. It is not a turning-point finally signalling acceptance by her peers, instead it is the moment of her most acute humiliation. It has all been a set-up. At the moment of Carrie’s greatest pleasure, the couple are drenched in a bucket of pig’s blood, symbolizing the menstrual blood of the shower scene, the bucket then falling and injuring her beloved ‘Prince’ right before her eyes. Worse than that, her repressive mother’s parting warning ‘They’re all gonna laugh at you’ appears to have been fulfilled. Carrie’s supernatural ability explodes in vengeance and in release from the sexual repression enforced on her by her mother. She can no longer ‘plug it up’. The female body and its’ fluids, its sexuality and reproductive power is a source of horror here, and the metaphor of telekinesis represents an attempt to deny the body – telekinesis being the ability to move objects with one’s mind, thus circumventing the need for physical contact. Can we see Carrie’s fury as justified as much as it is horrific? Is her appetite for destruction a symptom of her victimization by a repressive society, or is she a freak and a monster? Her mother seems to think so. When Carrie finally comes home after unleashing a torrent of pain and mayhem, she attempts to receive comfort in her mother’s arms by submitting to her mother’s repressive demands and regressing to childhood. Her mother responds by trying to murder her, brandishing a kitchen knife and declaring “I should have killed you when you were born”. Carrie’s telekinesis pins her mother to the wall and fills her body with a blizzard of flying knives, mirroring the statue of the suffering St Sebastian that she had been forced to contemplate when shut in the darkness of the ‘prayer-closet’. Frightened by sexuality, deemed ‘unclean and sinful’ by her own mother and unable to sustain the rigid standards of culturally sanctioned femininity, Carrie ends her troubled life by crushing and collapsing her world around her, wanting only for the ground to open and swallow her up. Is she to be pitied or feared – or both? She ends the movie as another woman’s nightmare, as Sue Snell, a survivor of Carrie’s high-school apocalypse and the only peer who had shown any compassion for her, wakes from her dreams of Carrie White’s gravestone screaming in terror. Carrie White certainly did ‘burn in Hell’ – but that Hell was called high school.